Yar, this article’s your guide to stop talking like a landlubber and start speaking like a seafarer worth their salt. Maybe that’s a little overboard, but learning some common nautical words and phrases will help you communicate more clearly aboard your vessel and others. Scientists have found evidence of boating since prehistoric times, and it’s exciting to think that some of the terms and phrases we still use today have been passed down and evolved over centuries. Besides being fun, learning nautical terms is a rite of passage to becoming a true boater — you have to leave the land-lingo on the shore. But you don’t need to carry around a maritime dictionary or study up on sailing phrases. With just a few choice words, you’ll be able to talk the talk in no time. In this article, we’ll take a look at the directions of your boat, some common boating terms and some of the nautical words and phrases that have dropped anchor in everyday speech. Let’s get going. When you’re onboard a boat with your friends and family, everyone becomes an honorary crew member — which is why it’s important for everyone to know a few simple boating terms. If you have young kids, playing pirate is an engaging way to teach them terms and have fun at the same time. Communicating on a boat is all about being clear. And if you’re the captain, sometimes you’ll need a little help to keep everything running smoothly — like with docking, for example. Sometimes, you don’t have time to clear up ambiguity in the moment, so it’s best to do it beforehand. If you and the people aboard know the basic boating terms, you can communicate better, and your boating experience will be better, too. 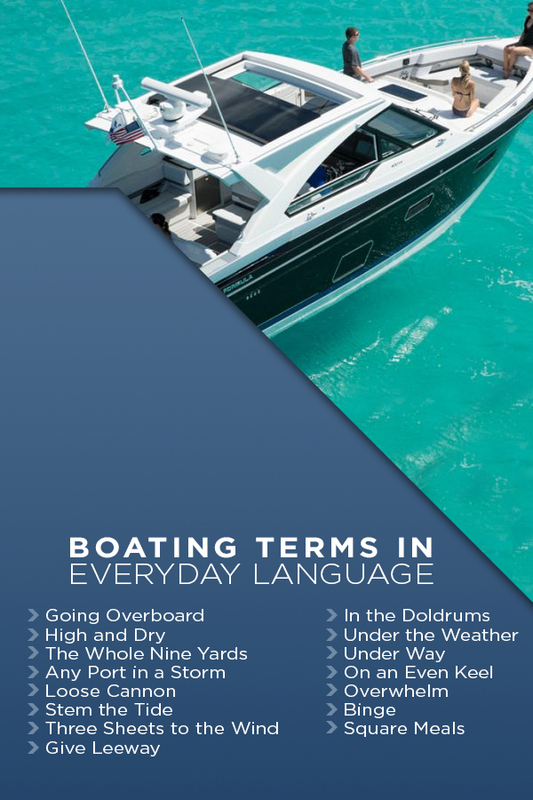 Of the terms you can learn to describe your boat, you’ll probably only end up using a few. But merely knowing these few terms indicates to experienced boaters that you know what you’re talking about. No more “front” and “back.” When you talk about the “front end” of a boat — it’s the “bow,” and the rear end of a boat is the “stern.” Simple enough. If you want to get fancy with your bow-and-stern speak, the term “abaft” means in the direction of the stern from a designated point. For example, “the lifejackets are under the cushion abaft the table,” means they’re in the compartment on the side of the table closet to the stern. The widest point of any boat is called the “beam” and is used to help determine the placement and angle of navigational lights, among other things. This one’s simple but important to know — the “transom” is the back portion of a small boat above the water line. It’s where an outboard engine would be mounted. Maybe the most common blunder of new boaters is to describe the two sides of a boat as “right” and “left.” While this may not seem to be a problem, using “right and left” can mean a different side of the boat, depending on a person’s perspective. Boaters use the terms “port” and “starboard” to take the place of “left” and “right” respectively. The difference? “Port” always means the left side of the boat if you face the bow, and “starboard” is the right side. Note: Boaters typically pronounce “starboard” as “starburd” not “star-board” because it’s less clunky to say. If you’re on your boat at night, you need to turn on your navigational lights — sometimes referred to as “running lights” — and be on the lookout for other boats’ lights, too. When you turn on your lights, you’ll notice that the one on your port side is red and the one on your starboard side is green. This shows other boaters which direction you’re facing and also determines right of way. We won’t get too deep into the right of way in this article, but in general, if you see a green light on a vessel — their starboard side — you have the right of way and should hold your course. If you see a red light, you’re looking at their port side, and you should stand down, as they have the right of way. If you see only a white light, it’s either a small vessel or the stern of another larger vessel, and they have the right of way. An easy way to remember — green means go, and red means stop. Another helpful memory tool is that your port side is red just like port wine is red. Boaters sometimes refer to narrow stairs as a “ladder.” On smaller vessels, you’ll usually find ladders that lead up to the flybridge — an upper deck from which you can drive — or down to the engine room through a hatch. A “companionway” refers to a passage wide enough for more than one person — your companion — to use at the same time. You usually won’t encounter companionways on anything smaller than large yachts or cruise ships. Just like on an airplane and in other limited-space vehicles like campers, the kitchen of a boat is called a “galley,” even when the kitchen isn’t so small — like on a cruise ship. You may have heard this term used in real estate descriptions for apartments and studios with small “galley kitchens.” It usually means the kitchen area is small and in one linear space, like one on a boat. If you ask for the bathroom on a boat, they may tell you where the “head” is instead. They’re both the same thing, except when you’re on the water people use the latter term. It’s said that the term originated from ancient sailing ships, where people would use an area near the bow — or head — of the boat as the restroom. They chose that area because the water that spilled over onto the deck would naturally wash away waste. Crew members would also sling a net over the side of the bow and dangle over the water while they did their business — we’re thankful times have changed. While there are a few situations in which a rope is called something else — like a “hawser” used to tie up cargo ships — the vast majority of the time, it’s a line. What you probably want to call a “map” of the coast, the sea and underwater features, is referred to as a “chart” when you’re on a boat. This goes for electronic systems, too — they display electronic charts, not maps. Note: Besides knowing their proper terminology, you should always keep paper charts aboard in case your electronic systems fail. Sometimes confused with the term “buoy” — which is a floating navigational aid — “fenders” are the inflatable rubber bumpers boaters use to protect a boat’s hull from damage. You sling them over the side when you side-tie to a dock or another vessel. Note: Boaters who take pride in the appearance of their vessel like to bring up their fenders as soon as they leave the dock. – Going Overboard: The phrase “going overboard” stems from literally falling out of a boat. If you’re acting in a way that means you’re going overboard, you’re doing too much and being extravagant, which can mean going for a swim if you act this way on a boat. – High and Dry: If you accidentally beach your boat during high tide, at low tide your boat would be far from the water and “high and dry” on the shore. On land, we use this saying to describe being stuck in a bad situation. – The Whole Nine Yards: While some may think “the whole nine yards” is some type of sports reference, it actually came from sailing. Old square-rigged sailboats had three yards of sail on each of their three masts. So, if you were going “the whole nine yards,” all of your sails were up, and you were running at full capacity. – Any Port in a Storm: While the origin of “any port in a storm” may be a little more obvious, it’s still one of the more fun nautical phrases to use when you have to settle on a solution, even if it’s not the most ideal. If you were a sailor stuck at sea in bad weather, you didn’t have the luxury of traveling to the port you liked best — you had to make for the closest one. – Loose Cannon: If you’re referring to someone who’s out of control and unpredictably prone to cause damage, you may call them a “loose cannon.” If a cannon were to break loose from the deck of a sailboat in rough seas, the heavy metal weapon would roll around and be extremely dangerous and unpredictable. – Stem the Tide: Today, the phrase “stem the tide” refers to being able to get through or hold back an oncoming event. It originally referred to a ship that was traveling against the flow of a tide, but still able to cover distance over water. – Three Sheets to the Wind: If your lines lost hold of all of your three sails — or sheets — you could no longer steer your vessel. That’s why we use that expression today to describe someone or something that is beyond its own control. – Give Leeway: We use the phrase “give leeway” today to refer to being forgiving, patient or not too strict. But it used to used to mean giving enough extra room to another boat that’s being blown into a downwind — lee — shore so that they have extra room to maneuver and avoid a bad situation. – In the Doldrums: While now we use to the phrase “in the Doldrums” to describe a period of inactivity, it derived from ancient sailing times. The Doldrums are a zone of latitude on earth where atmospheric circulation causes calm wind, which can mean not moving if you’re on a sailboat. These areas are also called the “Horse Latitudes” because sailors would sometimes throw the horses that they were carrying overboard if delayed for too long. – Under the Weather: If you’re not feeling well, then you generally stay at home and may label yourself “under the weather.” The phrase originated from sailors going below deck — under — to hide from a storm — the weather — where the rocking wasn’t so bad as above. – Under Way: If a ship is “under way,” it means that the lines have been cast off the dock, and it’s floating freely. Now, we still use the term to say that things are in progress. – On an Even Keel: While today we use the phrase “on an even keel” to describe things being well balanced and going as planned, it originated from boating lingo that described your vessel as evenly-loaded with cargo. – Overwhelm: To “overwhelm” used to mean to literally overturn or capsize a boat. It derived from Middle English and eventually evolved to describe any situation or load that’s too much to bear. – Square Meals: Now, a “square meal” means one that is sufficient and satisfying, but the term was derived from the square platters that used to be used to serve meals to crew members aboard ships. Here at Formula, we’re not just about building better boats — we want to build better boaters, too — that’s why we like to inform our customers. We want to help them comfortably jump into boating and start enjoying it right away. A family company since 1976, the Porters have been running things personally for 43 years. We don’t make anything we wouldn’t want to use ourselves, and our customer loyalty is a testament to our commitment to excellence. We don’t use anything less than the best materials and industry-leading design to create beautiful boats — vessels with unmatched functionality and performance. If you have any other questions about boating terms or would like information about any of our models, please don’t hesitate to contact us today.